Uglyworld #780 - Here You Goes (259-365), originally uploaded by www.bazpics.com. Not only have the little guys been helping me out with my expenses, making me tasty breakfasts etc, here you can see how little Babo has been greeting me each night after work. 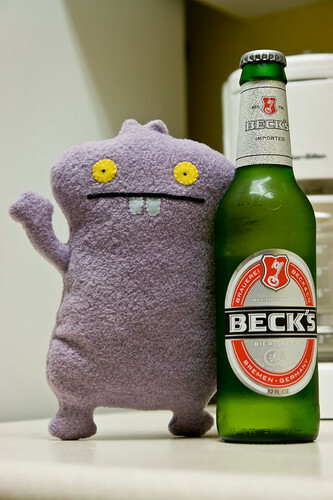 Tonight he decided to choose a bottle of Becks as my "beers refresherments" after dinner. The little guy sure does know how to make several weeks extension to my stay in Oregon go much easier, and he only asks for a 25% share of any crates of beer I buy, which isn't too bad a deal at all for the service he provides.